The SEC’s complaint against “Her Majesty’s Credit Union” lists the URL for the purported CD business. This screen shot by the PP Blog was taken at the URL. A scammer known by three names who’d earlier presided over an “insolvent” credit union in Georgia before being forced out of business in eight months went on to start a bogus credit union in the U.S. Virgin Islands, the SEC said. 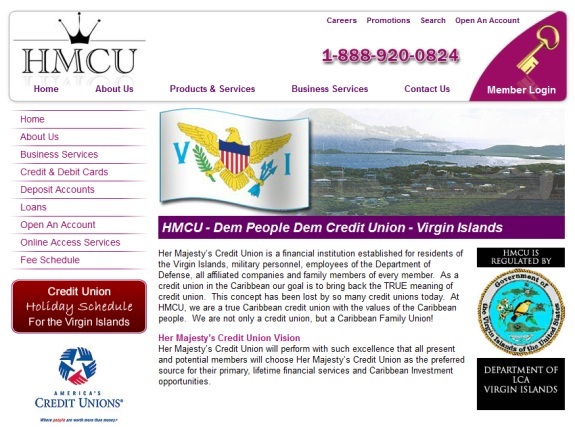 The Virgins Islands enterprise was known as “Her Majesty’s Credit Union” (HMCU) and sold bogus CDs, duping investors by trading on the names of Lloyd’s of London and government entities to sanitize the fraud, the SEC said. Charged in the alleged $532,000 caper was Stanley B. McDuffie of Denver. McDuffie formerly was known as Stanley Roberson and Stanley Battle, the SEC said. Mr. Roberson failed to produce documents pursuant to a lawful subpoena issued to him as part of our investigation of Her Majesty’s Credit Union. The Division of Securities then filed contempt proceedings in Denver District Court to compel production. Since its accounts are not federally insured, we are attempting to determine if Her Majesty’s Credit Union is offering only uninsured deposits or is engaging in the offer and sale of unregistered securities. After a subpoena enforcement action resulted in McDuffie being ordered by the Court to comply with the SEC’s subpoenas, McDuffie refused to testify in the SEC’s investigation, citing his Fifth Amendment privilege against self-incrimination in response to all substantive questions. The defunct Georgia credit union was known as the “Jilapuhn Employees Federal Credit Union,” the SEC said. “In August 2005, after JEFCU had operated for only eight months, the [National Credit Union Administration] determined that JEFCU was insolvent, and therefore it issued a Notice of Involuntary Liquidation and Revocation of Charter,” the SEC said. Our Take On ‘Rebates Aren’t Guaranteed’: What’s Yours? Did AdViewGlobal Insiders Know About Purported Bowdoin Indictment In May And Engage In Bizarre Summertime Cover-Up Bid?